(Official translation by the Authorised Representatives on behalf of the Recipients’ of the Late Queen Victoria’s Letter of Request April 1858. The letter is written in Maori only. Bound with The Letter of Request are the Laws of England). to take care of wrong-doing. teachings of the faith. That is why the majority of badness ceased in this land. will be maintained regardless of whether they are a person of small means or great means. 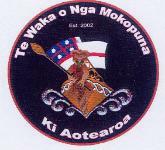 Maori, sent to the press and now released them out to you all, for consideration by that one and that one. therefore there is no escape for that person. offender. This may be successful or it may not. may grow together through goodness.